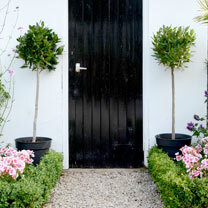 Create an architectural feature in any garden. Sweet Bay's dark green leaves are also great for cooking! Ideal for border or container. Simply trim back in summer to the original shape. 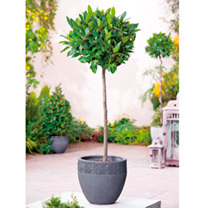 Available in two pot sizes: Standard - Supplied as an established standard with a 40cm stem and full head. Available in two sizes both supplied in 3 litre pots: total height 70cm or 100cm. (Please note that the decorative pot featured is not included with the plants.) Large - Supplied as an established standard with a 40cm stem and full head. Supplied in a 5 litre pot. Overal height (including pot height) 1.2m. Nothing brings more of a feel of style and sophistication to a garden or patio than evergreen plants that have been trained and clipped into formal architectural specimens. They create instant drama and will provide structure and interest for 12 months of the year, for many years to come! A pair either side of a doorway will always create the 'wow!' factor.